The Nature Center is the City of Arvada's environmental education facility. We offer many school and group programs to engage kids with nature. Using the nature trails, wetland areas and prairie ecosystems to explore, we connect kids with Arvada's parks and better understand nature. Topics are grade-level appropriate and meet Colorado science standards. The Nature Center also has 3,000 square feet, containing hands-on exhibits, wildlife displays, and classrooms. And, just outside is 25,000 square feet of a beautiful water-conserving demonstration garden. Visitors can discover native Colorado plants and wildlife both inside and out. View all our program offerings in the Activity Flyer PDF. Please call for more information and to schedule your field trip today! 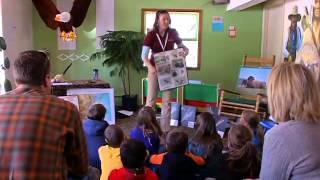 Not able to get your students or group to the Nature Center? Ask us to be a guest in your school or community area. Majestic View will work with you to design a program that fits the needs of your class or group. Topics are not limited to school field trip offerings! Please call for more information and pricing. FREE to all Arvada elementary schools! Build on the ideas covered in your water science unit by signing up for the Water Wise! Science and Conservation of Water Program and contest. Our staff will come to your school to present topics on the importance of water and water conservation, the water cycle, Arvada’s water sources, and more. Students then take home a water conservation activity booklet. If the entire class completes the booklet, they will win a prize. This program is sponsored by the Nature Center and the City of Arvada Utilities Division.